Water park or Waterboom is a tourist place that is visited by many tourists. Almost all major cities in Indonesia have Water Parks that are made as attractive as possible so that visitors who come to feel comfortable and entertained. Not only for water play, Waterpark or Waterboom also offers tours that can boost the adrenaline like a tsunami rides contained in Mikie Funland in Berastagi or surfing as in the free sea at FlowRider Waterbom Bali. If you are interested in vacationing with family by playing water, Here are 10 Best Water Parks In Indonesia that are worth your visit. Waterbom Waterpark Bali is already no doubt about its popularity. 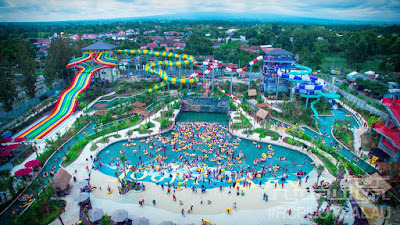 The Most Interesting Water Park In Indonesia, The Best Water Park In Asia and The Second Best Waterpark In The World, This indeed has the quality offered that makes the visitors are not made disappointed and even become addicted to this place. Waterboom the best in Indonesia you must visit. Suitable for family holidays or couples. 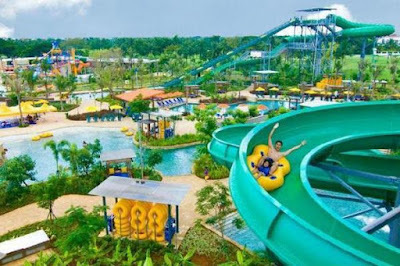 Waterbom park Bali enough adrenaline and We recommend trying all the existing rides. Finns Recreation Club is the largest Indoor Playground in Bali that is perfect for you on vacation with your sons and daughters. Vacation here besides the level of security has been well calculated, the staff who are on guard will also help you at any time. Holiday with family at Finns Recreation Club is great fun. The swimming pool is spacious, the grounds are spacious, the bounce is fun and very nice, the changing rooms are very clean as well as the gym and games facilities are plentiful. Very fun and fun playing or lazing at Canggu Club. Play a water slide, play a war in the pond, jump-jump with a trampoline, swim in a pool of currents and much more you can do at the Finns Recreation Club which certainly your holiday will not be forgotten with the family at the water park at Bali this one. When first learning to surf should be directly practiced in the sea, then now there is a special place to learn surfing is in FlowRider Waterbom Bali. Here is already an available place for you who like to surf, Pas for you and family who are on vacation to Bali to learn to surf. For one of these rides it is necessary additional costs, but no problem because you will be taught how to surf well with an expert trainer in the field. Let's enjoy a few rounds of a perfect combination of surfing, skateboarding, and snowboarding or relaxing sitting with a cocktail and enjoying the real thing. 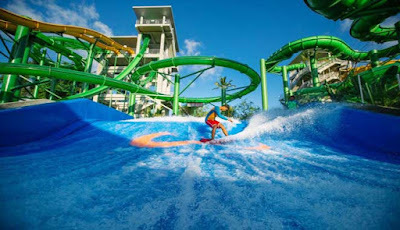 Waterpark Bali Indonesia is an exciting holiday alternative, playing water and trying various other exciting rides with family or friends make you feel at home for long at FlowRider Waterbom Bali. The Jungle Waterpark is the most interesting water park in Indonesia and quite popular in the city of Bogor. This waterpark is very okay and nice to visit with family. This place is very fun because there are many places to play there. In addition, this place is also cool because of the overgrown green trees around the park. The place is very beautiful compared to other water parks in Indonesia. Enjoying the holiday with the family was very happy. The Jungle Waterpark is highly recommended for water tourism because its ware is plentiful and clean and there is a freshwater aquarium beside the current pool as a form of educational facilities for tourists. 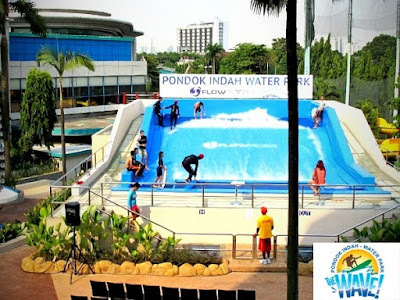 The Wave Pondok Indah Waterpark is not less interesting with the water park in Indonesia. Its location adjacent to Pondok Indah Mall makes this waterpark is very good for holidays and shopping with family. The Wave Pondok Indah Waterpark facility is quite complete. there are Olympic ponds, flow pools, wave pools, a water-skiing simulation pool with a fairly long slide. Waterpark here is quite safe and comfortable. FlowRider rides are exciting and quite challenging. Besides the bathroom is also clean and the Waterpark is very well maintained. Create a child is also very save really, they are given a float so baseball fear the children will drown. 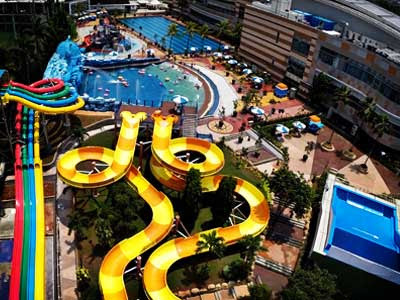 Ocean Park Water Adventure is one of the Best Water Parks in Indonesia located on Bumi Serpong Damai (BSD). This place is perfect for family vacations, the place is spacious and complete. There is a flow pool, wave pool, children pool, trampoline toys, flying fox and other rides with different themes. Rides in Ocean Park is not as extreme as other water rides in Indonesia so it is perfect for you who want to bring a small child. Many variations of the game for children who will survive in this area. The location is easily reached by public transport or private vehicle. In open since July 2007, Caribbean Island Waterpark is the Largest Water Park In Eastern Indonesia that you should visit while on vacation with family in the city of Balikpapan. Here you will enjoy the thrill of playing mysterious slide, Free Slide Fun, Water Canon, Octopus Tower, Slide Racer, Thousands of Pool Ball as well as Pirate Great Head spill bucket. In addition, Caribbean Island Waterpark also provides many other facilities such as the gazebo, swimming pool, 4-dimensional cinema, flying fox and mini outbound. If you're in Berastagi, stop by to Mikie Finland, play water with family or friends. Here a lot of exciting, thrilling and fun games. The location is quite extensive with the ticket price is quite affordable. Many game options are offered such as tsunami rides. Mikie Funland is an incredible vehicle for testing adrenaline. Well for those of you who like the challenge and test adrenaline, This place is very amazing. there are so many rides in it that are very challenging. One of the most extreme rides in Mikie Finland is a tsunami ride. This rides will really test your guts. So play as much. Jogja Bay Pirates Adventure Waterpark is one of the most interesting water parks in Indonesia that you can visit and enjoy with your family. This place is a water park that is still somewhat new in the city of Jogjakarta. For rental tickets the price is still quite affordable, there are a rental locker and rental gazebo. For his Waterpark ware, there are some fairly extreme slides. In addition, there is a current pool and wave pool which is a simulation of tsunami waves large enough but still safe to play water. Waterpark Jakarta is one of the Best Water Parks in Indonesia. Here spacecraft rides are very diverse. 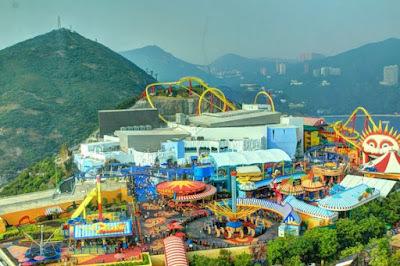 there is Aqua tube, speed slides, hairpin, wizard, twister and so forth. At Waterbom Jakarta, you will be greeted by very friendly and courteous staff, a clean pool, a beautiful atmosphere full of green trees and a large enough space. 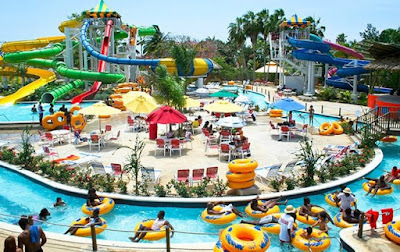 Waterparks Jakarta Indonesia is perfect for family holidays with children. Here a lot of water games that will make the kids feel at home for long.